Do you love spending time outdoors? 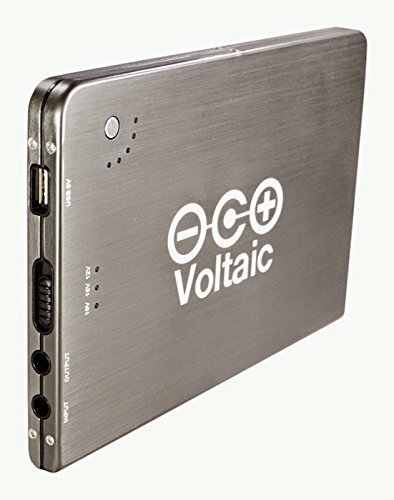 Voltaic Systems' 20,000 mAh/72 watt hour battery will power most laptops, tablets, smartphones, and digital cameras. Optimized to charge from solar panels and features two output ports: a high voltage port for laptops and a USB port for phones and tablets. The V72 charges from included AC charger or various 18V output solar panels. Input port: 5.5x2.1mm, Output port 5.5x2.5. NOTE: Some laptops have built in circuitry that may prevent certain adapters from charging their laptop. Please ask if you have any questions about your particular model. SOLAR OPTIMIZED - High quality, high temperature Li-Polymer cells tested and optimized for solar applications, housed in a brushed aluminum case. CAPACITY - 20,000mAh / 72 watt hours provides 1 full charge to most laptops, 7 charges to smart phones, 3 charges to 7" tablets, 1.7 charges to 10" tablets, and 3.5 charges to most DSLR batteries. Designed for use with Voltaic solar chargers, solar panels, and accessories. FEATURES - The V72 power conservation system shuts down automatically if no accessories are plugged in or drawing power.